We are called to grow in our relationship with God, relying on his strength, not our own flesh. The challenges that we face, help us become more like Jesus. We lean on God and not our intellect or human understanding. His love enables us to rest and enjoy his peace, regardless of the storm. Thanks for this great reminder…. It can be so difficult as a man to admit that I am powerless and weak…. but I know that I am and that I can lead on God for guidance and support! Yes! One of the translations of be still is to be weak and let God control. You are right on it! Thank you for your daily affirmations! I especially love the little lamb with this one! Great! 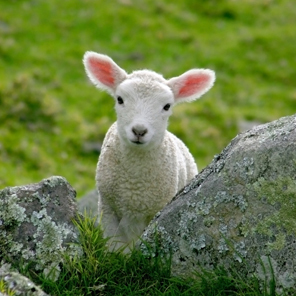 The lamb is each one of us! Thank You, Lord Jesus for all that You are! Yes, be still and weak as he carries you! Humility and meekness are heart attitudes that we bring before the Lord; doing away with prideful behaviors and lofty thoughts about ourselves and our own performances. Weakness, though, is a physical attribute, dealing more with personal ability to accomplish, or not accomplish, a task. I believe the Lord is calling us to be meek and humble, not weak. To the contrary, in 1 Corinthians 16:13-14, we are called to stand firm in our faith, to be strong, and to do everything in love. In Matthew 5:5, we are told “Blessed are the meek, for they shall inherit the earth”, and we need to understand that meekness is not weakness! Meekness is all the strength and power of a stallion that has been broken, yet controlled and ready for use at the will of its Master – it is not weakness. Psalm 82:4 is a cry out to rescue the weak from the wicked – why would the Lord wish us to be the weak? He asks that we humble ourselves before Him – He commands that we show Him reverence by humbling ourselves and He raises up those who demonstrate humility (2 Chronicles 7:14; Psalm 147:6; Psalm 149:4; Isaiah 66:2; Luke 1:52; Luke 14:11; Ephesians 4:2; James 4:10; 1 Peter 5:6). And we are reminded throughout scripture that the Lord delights in strengthening us through His Spirit (Psalm 28:7-8; Psalm 118:14; Isaiah 40:29-31, Nehemiah 8:10; Ephesians 3:16; Ephesians 6:10; Philippians 4:13). AS THE CLIMAX of Psalm 46, this verse is not so much about meditation as it is about the mediation of God’s kingdom in the heart of faith. The command to “be still” comes from the Hiphil stem of the verb (רפה) rapha (meaning to be weak, to let go, to release), which might better be translated as, “cause yourselves to let go” or “let yourselves become weak” (in poetic contexts, the noun form rephai’im was sometimes used as a synonym for “the place of the dead”). My favorite verse, Be still and know that I am God, is a good one to meditate on. However, I don’t like the (be weak), it throws a wrench in my meditation. The original Hebrew means be weak, when you are weak, you are still. Having God, as your strength works better, even in your meditation! I understand the idea of in weakness we are still. I like to break this down by saying, Be still and know that I am God. Be still and know. Be still. Be. Saying Be weak, throws me off. I will continue to contemplate Be weak. I know there is a lesson here for me, but my ego is in the way. If we are open to it, willing to let it happen, the trials we face will point out what stances and attitudes get in our way of connection to God. Being still…being weak…is a neutral (submissive?) open stance, i.e., not resistant, defensive, angry, or full of hate, pride, remorse…but just present. You summed it up very well Smoke! Hallelujah! God is in control!